1. Areas of deformation that occurred at the beginning of the early Paleozoic (the so-called Salairides), which include the Eastern Sayan, Kuznetsky Alatau, the basement of Minusinsk depression, and Gornaya (Mountainous) Shoria. 2. Areas of deformation that occurred between the middle Cambrian and the beginning of the Devonian (the late Caledonides), which include the Corny (Mountainous) Altay, Chulyshman plateau, Western Sayan, and the Oka-Dzhida region of the Eastern Sayan. 3. Areas of early Carboniferous folding (the early Hercynides) including the Anuy-Chuya region. 4. Areas of the Permian folding (the late Hercynides), including the Irtysh-Zaisan region, Rudny (Ore) Altay, Salair, and the Tom-Kolyvan region, where orogeny began in the Ore Altay, affecting the Irtysh-Zaisan and Tom-Kolyvan regions only in the middle Permian. Although this model times the orogeny and describes orogenic processes, it does not address the nature of the tectonics that resulted in the evolution of the mountains. Instead, it links the orogeny in Southern Siberia to the classic orogenic model of Europe, despite an obvious lack of physical connection. More recently a new, so-called 'mobilist' model has been developed which approaches the formation of the Siberian mountains via the framework of plate tectonics. This is best described by Zonenshain et al. (1990) whose monograph 'Geology of The USSR: A Plate Tectonic Synthesis' is recommended for in-depth analysis. According to the mobilistic model, the early Paleozoic structures ('Salairides' and 'Caledonides') formed as a result of the accretion of numerous blocks, situated in the Paleo-Asiatic ocean, to the Siberian continent. One of the most important events of that time was the collision with the Tuva-Mongolian massif, which resulted in the Salair orogeny, intrusion of batholiths, and the formation of the granite-gneiss domes. Subsequent collisions (e.g., with the Altay microcontinent) in the early Devonian caused the formation of the early Paleozoic ('Caledonian') fold belt. At that time, Siberia, together with the accreted Alatay-Sayan margin, passed over a hot spot (ascending convective flow in the mantle) which produced intense interplate magmatism, extension, and block movement. From the middle Devonian, there was a major change in Siberian tectonics as the Kazakhstan continent began to converge with Siberia, consuming the oceanic floor, and a number of subduction zones developed. The convergence between Siberia and Kazakhstan continued through the early Carboniferous, with the Salair block moving into the subduction zone and being thrust over the margin of Siberia until the middle Carboniferous when the main collision between Kazakhstan and Siberia began. By the late Permian, the whole of the Altay-Sayan area was under compression, which caused nappe thrusting along longitudinal faults and shearing along latitudinal ones. The late Paleozoic ('Hercynian') structures formed as a result of the collision of Siberia and Kazakhstan, which was completed by the end of the Permian. The Mesozoic was characterized by a lack of orogenic activity. By the beginning of the Tertiary, the Altay-Sayan mountains had been eroded, forming a vast denuded hilly plain similar to the Kazakh Knolls of today with shallow marine and lacustrine basins. The rejuvenation of the mountains began in the Oligocene, affecting not only the Altay — Sayan — Baikal area but a much larger mountainous belt of Inner Asia which stretches from the Pamirs, Tien-Shan, Himalayas, and Tibet in the south to as far as the Verkhoyansk mountains in the north. The earlier literature explained the formation of the rejuvenated mountains in terms of vertical block movements. However, true block mountains are not widespread in Inner Asia, although ridges of the Baikal rift zone do belong to this type. In the formation of other mountains, horizontal deformations play an important part. This is not a new idea. Already in the 1960s, Florensov (1965) concluded that the pedestals of the mountainous massifs in the Gobi might be caused by crustal warping rather than block movements alone. Later the important role of plastic deformation was described for other mountains of the southern edge of Eurasia most notably by Molnar and Tapponnier (1975; Tapponier and Molnar, 1977, 1979). They explained the orogeny in terms of plate tectonics. This showed that the rejuvenated mountains result from the collision of the Indian subcontinent with Eurasia. This model was further developed by Zonenshain and Savostin (1981) who argued that the collision led to the fragmentation of the Siberian craton boundary and that subsequent orogeny was a result of the interaction between the Siberian platform and the microplates. Analysis of seismic activity, experienced by the rejuvenated mountains, has contributed to understanding of their development. A seismic zone begins in the western spurs of the Gissar Ridge and runs north-eastwards, continuing along the northern slope of the Altay and the Western Sayan as far as the central Eastern Sayan where it passes into the seismic zone of the Baikal rift. The regions located to the north-west of this line (e.g., the West Siberian lowland or Central Siberian tableland) experience low seismicity. There are a number of areas where earthquake epicentres are concentrated (the Altay being one such zone) but on the whole epicentres are dispersed south-eastwards of the maximum seismicity belt. Another prominent feature of the region is a complex melange of high ridges, elevated plateaux, and deep basins generally striking north-east. The earthquake data, together with the analysis of topography and distribution of seismoactive faults, have allowed the reconstruction of subsurface conditions. 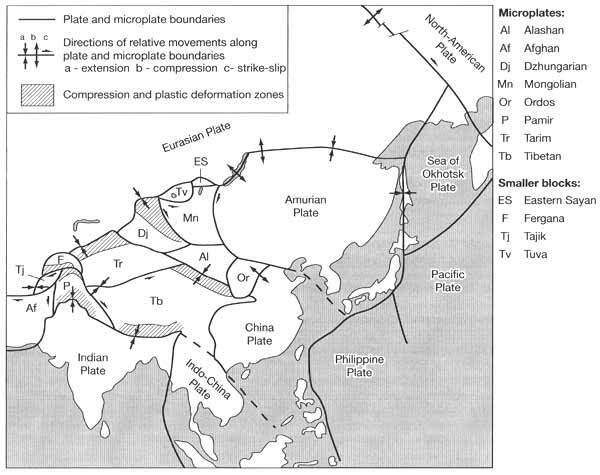 The scattering of seismicity indicates that the boundary of the Siberian craton is not a single line but a mosaic of small plates and microplates (Figure 14.1). The mosaic structure appears only between India and Eurasia, indicating that the convergence of the two is the most likely mechanism responsible for its formation. Although the direction of India's movement is northerly, the split did not proceed northward where the Eurasian Plate has maximum strength but instead adopted a north-eastward direction, pointing to the junction of the Eurasian, North American, and Pacific Plates and adjusting to the more ancient zones of weakness. Following the split, the further northerly movement of India was accompanied by differential movement of the microplates. The interaction of the microplates has resulted in crustal compression and shortening along their boundaries, reaching 20-50 km in the Altay. Thus, the mountains of Southern Siberia, including the Altay, Western Sayan, and the Stanovoy Ridge, developed as a result of continental fragment collision and deformations at the Siberian Plate and microplate boundaries. The Baikal rift is a part of the rejuvenated mountains of Inner Asia. It is an area of considerable seismicity, continuing uplift (Golenetsky, 1990; Sherman, 1992) and elevated heat flow (Lysak, 1992). But was the collision of India with Eurasia responsible for the opening of the Baikal rift at 30 Ma BP or did the Baikal rift and the adjacent mountains begin to develop independently? The origin of crustal extension in the Baikal rift zone is the subject of a debate between the supporters of passive and active rifting models. The passive rifting model sees the rifts as resulting from extensional stresses in the lithosphere, which permits the subsequent upwelling of hot mantle which in turn induces thermal uplift. By contrast, the active rifting model sees rifting as developing as a response to the tensional stresses induced in the crust by upwelling of the asthenosphere. The passive rifting model views rifting as a passive response to regional stress which results from the interaction of plates influenced by large convective flows in the mantle. The extension is assumed to be generated by global phenomena rather than local ones. The location where rifting occurs corresponds to a divergent plate boundary, while domal uplifting begins after the initiation of rifting and intensifies it. The passive rifting model attributes crustal extension in the Baikal area to horizontal forces related to the kinematics of Asia initiated by the collision between India and Eurasia (Molnar and Tapponnier, 1975; Tapponier and Molnar, 1977, 1979; Zonenshain and Savostin, 1981). Which evidence supports this point of view? First, the beginning of rifting coincides with the start of the collision. As a result of the collision, a minor Amurian Plate split off from Eurasia, began a rotary movement relative to Eurasia, and a divergent boundary and associated rifting developed where it was moving away. Second, the Baikal rift zone disappears at its flanks. The disappearance of the rift zone in the south-west is accounted for by the existence of the microplates that fill the space between the Eurasian and Amurian Plates and prevent extensional conditions. In the north-east, the Eurasian and Amurian Plates are converging and the uplifted topography of the Stanovoy Ridge corresponds to this segment of the boundary that experiences compression. This pattern of interaction between the Eurasian and Amurian Plates explains the S-shaped form of the Baikal rift. Third, there is a close similarity and synchronicity between the development of the Baikal structures and similar geological events in the mountains of Southern Siberia and Mongolia. Fourth, the uplift of the Sayan-Baikal dome (which has three culminations: Eastern Sayan-Khamar-Daban, Ikat-Barguzin, and Kodar-Udokan) occurred after the onset of subsidence of rifted basins as indicated by the presence of the Mesozoic pre-rift sediments and consequently thermal doming was not a major mechanism for its development but a consequence of stress-induced crustal deformation. The active rifting model sees crustal extension and sideward movement as primarily caused by the upwelling of the asthenosphere over regions of hot spots (Artemov and Artyushkov, 1971; Zorin, 1971, 1981; Logatchev and Zorin, 1987; Logatchev et al, 1983). The key argument in the active rifting model, based on deep seismic sounding surveys, is the presence of partially molten, low-diffusivity mantle material beneath the Moho surface. This asthenospheric upwelling induced domal uplift and the crustal extension which is necessary for the formation of rift depressions. The area of arched uplift is great, extending over 1500 km and being 150-300 km wide. The dimensions of the upwelling exceed those of the extensions, which implies that the upwelling could not be formed passively due to plate divergence. Volcanic activity occurred in the Baikal rift zone, and fissure type eruptions produced basalt flows. The volcanic materials display a wide range of chemical compositions from essentially alkaline to tholeiitic ones, but late Cenozoic volcanics are represented mainly by alkaline olivine basalts. The total volume of Cenozoic volcanic material in the Baikal region is relatively modest, and is, for example, only a fraction of that found along the Kenyan Rift Valley in East Africa. During the last three decades, the Baikal rift zone has been subject to comprehensive geological and geophysical research, including deep well drilling, gravity and aeromagnetic surveys, and geothermal and seismic studies by numerous Russian and international teams. The data have been extensively analysed in order to understand the structure and evolution of the Baikal rift zone and the adjacent mountainous areas. Many reviews have been published including Zonenshain and Savostin (1981), Zorin etaL (1989, 1990), Logatchev and Zorin (1992). Considerable insight has been gained into the geodynamic processes but in many respects the present knowledge is imperfect and further contributions are required to solve problems of the Baikal rift development as well as general problems of intracon-tinental rifting.